Once again Mobile Nations has assembled at CES, and we've come together with the Cell Phone Junkie to talk NVIDIA's Project Shield, 4K (2160p) televisions, giant phones, low-end phones, and all the rest of the news -- and the show hasn't even officially started yet! Deleting an email message is a simple task of just swiping it off the side of the screen, but this doesn't actually delete the email message. Instead, it just moves the message to the folder that you set as you default trash folder. If your trash is set to the official Trash folder of your mail program, this probably gets cleared out on a regular basis automatically. However, if you set your folder to be something different, the size of that folder can get rather large and the only way to clear it out would seemingly be to do it from a computer. But that is actually not the case. 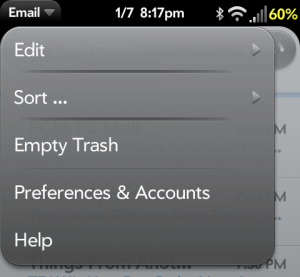 If you open up the trash folder on your webOS phone or TouchPad (the folder should have a icon next to the name), you can then swipe-down from the top-left to bring down the Application dropdown menu and you should have an "Empty Trash" option. Tapping on that option will bring up a pop-up asking you to confirm that you want to permanently delete anything in that folder. Tap the "Empty Trash" button and every email that is synced to your device in that folder will be deleted. It is important to note that only those emails synced according to your email retention settings will be deleted. Any emails beyond that timeframe will remain in that folder on your email system. Monday Brief: Mobile Nations @ CES 2013! With most of the Mobile Nations team having arrived now in Las Vegas for CES there was no better time to get together for a video. Straying away from standard Monday Brief format, I managed to wrangle everyone into a room to find out their thoughts and expectations for CES 2013. You'll want to stay tuned to all the Mobile Nations sites for up to the minute coverage but for now, check out the video! Mobile Nations show 20: CES 2013 preview! Mobile Nations goes to Las Vegas - It's time for CES 2013! Verizon BlackBerry Z10 shows its beautiful face! Over the course of the four years since the debut of the Palm Pre, the device menu--that dropdown menu that you get when swiping down from the top-right of the screen--has basically looked the exact same on all phones from the original Pre running webOS 1.0.1 to the Pre2 and Pre3 running webOS 2.2.4. Sure, webOS 2.0 added VPN to the menu and there are numerous patches that will help you customize it, but the basic look and feel of the dropdown menu hasn't changed, even on webOS 3.0 on the TouchPad. Hot on the heels of releasing an alpha version of his UI Scale patch to bring the 4x4 launcher back to the Pre3, homebrew developer extraordinaire Garrett92c (who has also brought us the Glass Effect Suite theme, AIOSettings, Dash Weather and much more) decided that he wanted to give the Device Menu a complete overhaul. Simply named "New Device Menu", his new patch for webOS 2.x phones converts the menu from a long list of vertically-aligned options to a horizontally-aligned set of tabs that split out each section as their own menu. Garrett has scavenged around all the existing patches to bring almost every conceivable option that is currently available (and even some that aren't) to make this the most complete Device Menu patch yet. 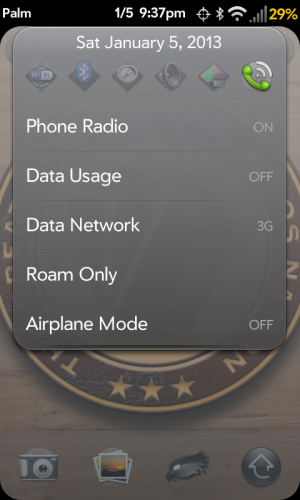 Some of these options include GPS and Location Services options, a sounds section that gives you quick access to ringtone, media and system volume levels, a brightness level, a flashlight toggle, and a phone menu that adds toggles for the phone radio, data use, network selection and a roam only option. For Pre3 owners who use the "Cycle WiFi" patch, that's even in there, too, by press-and-holding on the WiFi status row. There's even a rotation lock toggle in there, but you need to have xwTweak homebrew app installed for that. This patch is just a few days old and is already fully-functional, but it is still in beta as Garrett has been releasing daily updates for users to test as he continues to add new functionality. The patch isn't in Preware, yet, but you can grab it from the webOS Nation Forums at the source link below. There are also a lot of great ideas that have been suggested to Garrett in our forums and he has been working to add as many of them in as he can, including making it Tweaks-compatible to allow the user to customize it. This patch should work on all webOS 2.x devices, but see the forum thread for devices that have had successful installation reports and note that there are separate patches for US and ROW (rest of world) users. The patch is naturally incompatible with most other Device Menu patches, such as Jason Robitaille's "Device Menu Megamix", sconix's "Advanced Device Menu", or GuyFromNam's "Cycle Wi-Fi in Device Menu" patch, but seems to work with almost all other patches out there, including the rest of sconix's Advanced patches. If you are interested in trying it out, check out the forum thread to grab the patch and use webOS Quick Install or Internalz Pro to install it on your device. Feel free to add your own suggestions to the discussion if you have any great ideas. And don't forget that homebrew developers like Garrett are doing this on their own time because they love webOS and want to continue to support the webOS community. If you like his work and want to show your appreciation, consider sending a donation his way. Details are in the forum thread if you are interested. The webOS Nation Forums have always been a font of awesomeness, and there's no sign that's going to stop anytime soon. Some of our favorite moments come about when somebody poses an interesting question and the community runs with it. We've been having one of those moments since yesterday, when mattmers asked "Is the OS market too full for webOS?" Matt put together a daunting list. On top of the mobile operating system pile are Android and iOS, with Windows Phone 8 and soon BlackBerry 10 fighting for a distant third place. Then there's the bottom tier, a group of operating systems fighting for recognition from a carrier or manufacturer, let alone sales. They include Firefox OS, Sailfish OS, our beloved webOS, and the recently-announced Ubuntu for phones. In an operating system market with two dominant players and two duking it out for a distant third place, is there really space for four different operating systems to be engaged in a battle royale for the attention of manufacturers, carriers, developers, and users? Compelling reasons to pick from this crop of unloved operating systems are few when there are established options like Android and iOS available for all parties involved. That's not to say that we don't love webOS; we do, but there's no way we could in good faith recommend to a friend that they go seek out a Pre3 or a TouchPad or hack Open webOS onto their Galaxy Nexus (at least not yet…). As Windows Phone and BlackBerry show, there's a question of if there's even a viable third place in this hyper-competitive market. Let alone a fourth, fifth, or sixth player. Apple, Google, and Samsung have succeeded at convincing users, developers, and carriers to go with their hardware and software, and it's increasingly becoming a two-party race in smartphones. The jury's still out on tablets, with Microsoft's Windows 8 and Windows RT still playing out, but with the high turnover and subsidized prices of smartphones it's getting harder and harder to break in with each passing day. Of course, there's a question of if webOS needs the be on smartphones to survive. Despite being on a dozen carriers world-wide for years and carrying the brand power of Palm and HP, webOS never quite took off like we would have liked. There's a multitude of reasons for that failure and we won't bother opening up that wound again, but it's entirely possible that the door has closed on smartphones for webOS. There's still definitely an opportunity for tablets, but things would have to get rolling in the very near future before that door closes too. In all of the rumors and rumblings of what HP/Gram is doing, we've yet to hear a peep about smartphones. In fact, the biggest story of what Gram is working on hasn't been a smartphone or a tablet, but a partnership with LG to produce a webOS-powered smart television. Whether or not webOS will be a good fit for an HDTV, well, we'll have to see it first before we pass judgement, but it speaks to the flexibility of webOS as a multi-purpose operating system. It's entirely possible we'll never see another webOS smartphone or webOS tablet, but that webOS will still live on successfully in other applications. But when it comes to fan bases and communities, that's much harder to maintain when you're talking about televisions or (just ruminating here) automobile nav units or refrigerators. But we'll cross that bridge if an when we get to it. 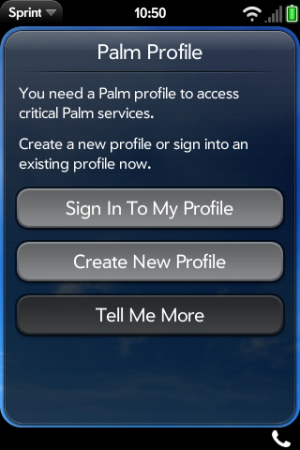 When Palm developed webOS, they did a great job of backing up the majority of your settings in the Palm Profile backup, such as your App Launcher setup, your synergy accounts, web bookmarks, contacts/calendar/memos entries to your Palm Profile, and more. As webOS progressed from version 1.0.1 to where it is now, the data that was included in your backup also expanded, now including your Linked Contacts and some application data if an app developer utilizes that functionality in their app. However, there are few big omissions in the Palm Profile backup, such as saved application/game data and homebrew apps/patches. If you have added some of the advanced scripts to Save/Restore to backup some additional system files or images, you will need to be sure to add those scripts back to your new device before running a "Restore applications" from within Save/Restore. Unfortunately, neither the Palm Profile nor Save/Restore will restore your learned words or shortcuts that you added to Text Assist on your webOS 2.x or 3.x device, but you are able to get a backup of those settings by using manual command line commands or using Save/Restore. From here, you can manually add that data back into Text Assist on your new device or follow the steps outlined in our Restore your Text Assist learned words and shortcuts tip to use command line to add them back. While your Palm Profile backup will restore your synergy email accounts and most settings, it will not restore any default email folders that you set for your Sent, Draft or Trash folders. While Just Type and Exhibition mode were two great features in webOS 2.x (and continued in webOS 3.x), their settings were not carried over when you restore your device. Be sure to go into your Just Type preferences to enable your preferred Quick Actions and Launch & Search settings, and open up your Exhibition app to toggle which applications you want visible in Exhibition. Just as with your Just Type and Exhibition settings, your Palm Profile will also not restore every setting on your device. So, you may want to open up the various settings apps to make sure that everything is set to your own personal preferences. For example, open up the Screen & Lock app to adjust your screen time-out setting, set a power-on PIN or password, or enable Advanced Gestures to toggle fast-app switching with a full swipe in the gesture area. Or open up the Sounds & Ringtones app and make sure you have the right ringtone set for your device. Got any other suggestions not included above that you follow when you restore your profile onto a new webOS device? Kevin, Phil, Daniel, and Rene talk about CES 2013, what they expect to see, and whether it's still relevant, then fight about ActiveSync, RIM vs. Microsoft, and what they want to see from Apple, Google, and everyone going forward! Apologies for the video quality, we experienced severe technical problems during the recording of the show, and while we're providing it for those who really want it, we recommend sticking to audio for this episode - check out the swanky new HTML5 player below. If you're like me (and who doesn't want to be like me? ), your webOS device is constantly full of multitasking app cards. Some are fleeting, around for until you don't need them anymore and then tossed off the top of the screen like the day's garbage. Others are important, and you keep them around because you don't want to deal with relaunching the app later, need it to be running in the background, or just want to have whatever's in that card available for quick reference later. For that latter category of app cards there's a problem lurking in your quick-gesturing thumb: the inadvertent toss-away. It's too easy, we know. You're busy closing away unneeded cards at the end of the day and before you know it you've tossed away the web browser card with that restaurant address you were going to need later that evening. Curse words fly forth as you're forced to reopen the browser, dig into your history, and find the lost page. But… what if you could lock that card and make it so you couldn't accidentally throw it away? Wouldn't that be grand? Yes, it would indeed be exceedingly grand. But locking a card should be a very deliberate action, something you can't do or undo accidentally. Our simple and straightforward proposal: pull down and hold. The current pull-down behavior in webOS varies depending on the version. webOS 1.x and 2.x treat a pull down the same as tapping on a card, merely maximizing the card. It makes sense - if pushing it away is closing it, pulling it down - towards you - should be the opposite, making the card active. But webOS 3.x left us scratching our heads, as pulling down on an app card instead triggers a slingshot that throws it off the top of the screen, closing any background processes for running built-in apps. Useful, but in no way intuitive. So our proposal is really two-fold. First: restore the pull-down-to-open behavior for cards. Second: add a pull-down-and-hold gesture to trigger locking a card. For a visual cue, add a red glow and a lock icon on activation, and have a translucent lock icon superimposed on the locked app in card view. Swiping up on a locked card triggers a vertical wobble (perhaps with a red glow at the top of the screen), and unlocking is accomplished by the same pull-down-and-hold gesture. Simple, intuitive, discoverable, and it doesn't get in the way if you don't need it. Most of all, it's useful and a life-saver of sorts. Have your own thoughts on this or any other webOS Wish List entry? We'd be disappointed if you didn't. That's why we have the comments, it's your place to say how incredibly right (or horribly wrong) we are, plus there's a poll! And we have little doubt you have your own ideas as to what ought be on the webOS wish list, and so there's a forum thread just for that where awesome webOS dreaming is the order of the day. Open source! Free! Gestures galore! 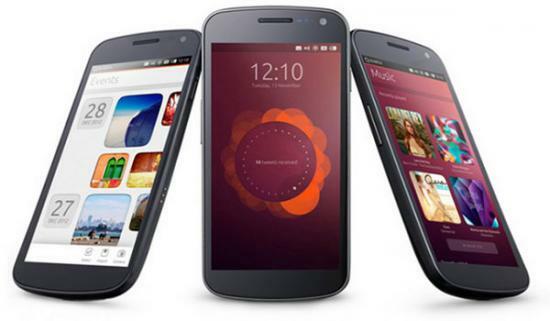 Today brought a surprise from London with Canonical's newly announced Ubuntu for smartphones. We're not going to be too critical of Ubuntu here, after all, we write about webOS here, we don't have many legs to stand on when it comes to mocking other operating systems. So… good luck with that. Canonical's Ubuntu operating system has ben around for years for the desktop and they've recently been making a good deal of noise about extending Ubuntu to other platforms, wanting to get Ubuntu running on screens big, medium, and small with the same general interface. You know, like Open webOS. Where Ubuntu 12 on the desktop is a fairly intuitive and easy-to-grasp user interface that relies on pre-existing interface conventions in common with Windows (pre-Windows 8, that is) and Mac OS X, Ubuntu for smartphones offers a fairly fresh take on the smartphone user interface. One can look at Ubuntu for phones and see where certain parts of the OS may have taken inspiration, with heavy doses of BlackBerry PlayBook and BlackBerry 10 along with measures of Android, Windows Phone, and webOS. Ubuntu for phones is far more reliant on gestures than any smartphone OS to date, perhaps to its detriment. Where gestures in webOS were relatively easy to grasp (swipe back, swipe up, and swipe off), Ubuntu for smartphones is entirely dependent on gestures to to the point that user interface discoverability has all but evaporated. webOS had some small discoverability issues, iOS and Windows Phone have always been perfectly obvious, and Android has greatly improved on the discoverability front. Ubuntu, on the other hand, requires knowing gestures just to get past the lock, er, 'welcome' screen. As John Gruber of Daring Fireball put it, "it’s like a desktop interface with nothing but keyboard shortcuts." Ubuntu for phones also faces the same set of issues as webOS: convincing manufacturers to pick it up and run with it. It's hard to say who has the tougher road here, though the two Linux-based operating systems both have a difficult path to acceptance ahead of them. And hey, they both run on the Samsung Galaxy Nexus. That's fun, right? As with any struggling company, HP's looking at ways to streamline their business and raise some cash in the process. Late last month HP send a 10-K filing to the US Securities and Exchange Commission that the company will "continue to evaluate the potential disposition of assets and businesses that may no longer help us meet our objectives." In plain talk: if you're a part of HP but aren't helping out the bottom line as much as HP would like, you might not be part of HP for much longer. Of course, the ideal method for getting rid of those not-helping-HP units is for HP to sell them. You know, stop losing money by making money. This isn't the first time HP's looked at selling parts of the company. In fact, a lot of HP's problems over the past year can be traced back to efforts to dispense with large parts of the company. It was the plan of then CEO Leo Apotheker and still-Chairman Ray Lane to split HP into two distinctly separate companies, with one focusing on enterprise software and the other built around the declining PC business. That plan kicked off a firestorm in Palo Alto and Wall Street, ending with the ouster of Apotheker. HP also tried and failed to find a buyer for webOS and/or the webOS Global Business Unit at a favorable price, eventually opting instead to commit webOS to open source and spin off the GBU as a standalone company. Or at least, that was the plan months ago. Gram, that standalone company, has yet to launch, and since HP's decision to open source webOS a year ago the mobile landscape has dramatically changed. Could HP be weighing giving a sale of webOS and it's GBU another go? Not likely, considering how much they've invested in spinning off Gram so far, but… crazier things have happened.